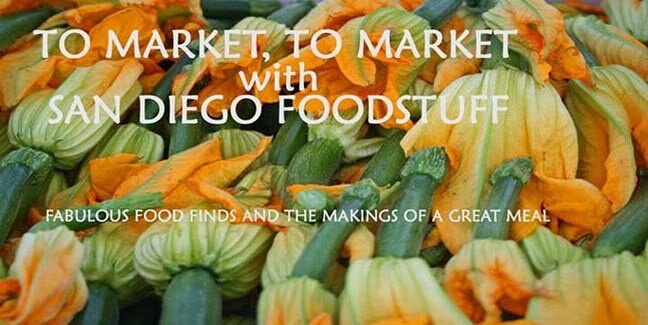 There are certain foods that no matter how simple they actually are to make if you actually endeavored to learn how still have a mystique about them. Caramels, for me, fall into this category. Honestly, we're talking just four basic ingredients--butter, cream, sugar, and corn syrup. But this quartet, once cooked together, is the foundation of sweet magic--that is, if you use really good ingredients and have the finesse and creativity to take it to a sublime level of deliciousness. Nancy Flint understands this. 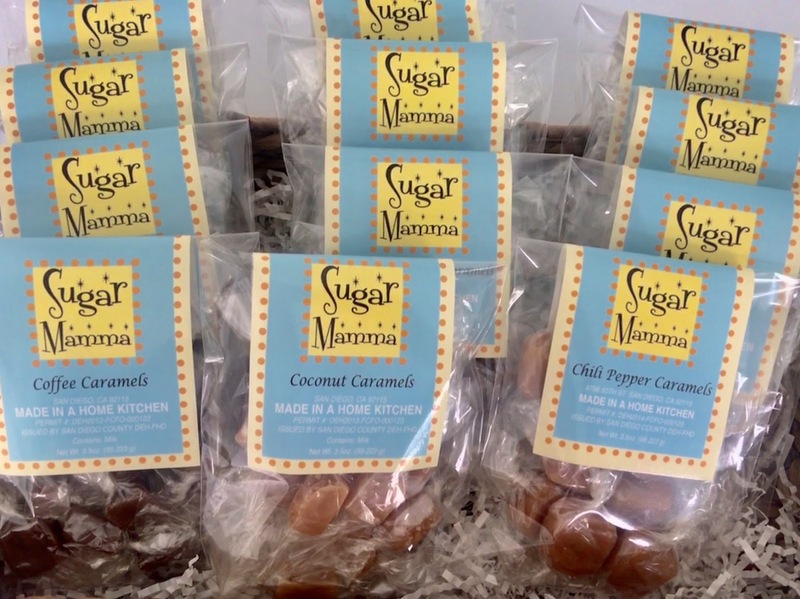 In fact, five years ago she created a small business--Sugar Mamma--around caramels. 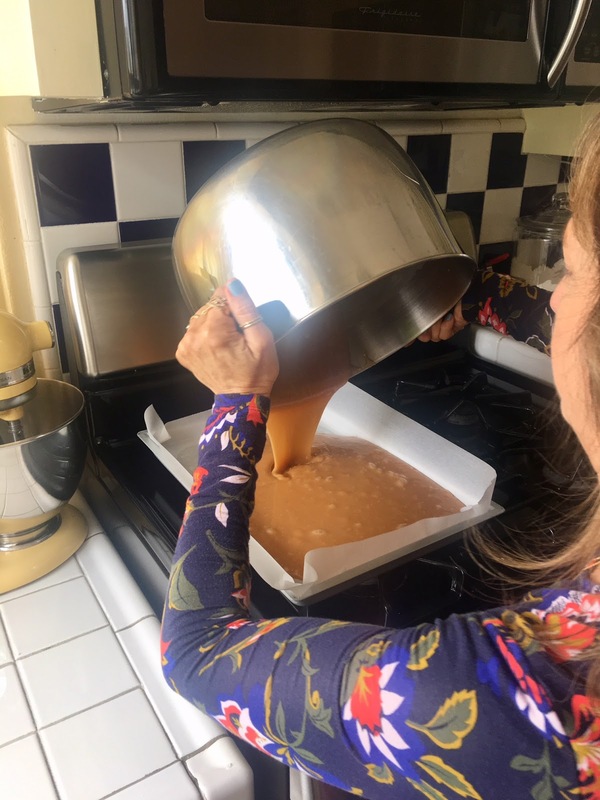 She's taken these four basic ingredients and elevated them with various flavorings to create 17 flavors of caramels that you can find all over San Diego County. Flint, once a lactation consultant, had to give up her calling in 2002 when she was diagnosed with stage 4 lymphoma right at her 40th birthday. She survived and acceded to her two daughters' request to spend more time together by homeschooling them until high school. During that time she had been making sea salt caramels as Christmas gifts, tweaking various recipes until she came up with her own version. 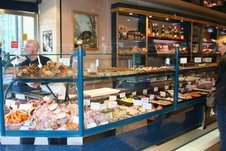 Over the years friends and family were on her to enter the caramels into a food competition. 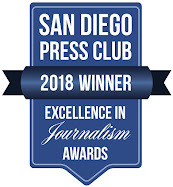 Finally, in 2012, Flint entered them at the San Diego County Fair--and won. From there she was featured on the CW. When asked by the TV hosts where people could buy her caramels, she had no answer. But a lightbulb went off. And that's when she started her home-based business. Today, her small-batch caramels (and marshmallows) are sold primarily at boutiques and hotels in San Diego County--the Hotel del Coronado, the Manchester Grand Hyatt, Pigment in North Park, Vom Fass in Hillcrest, and the Perfect Pineapple in North County are just some of the venues that carry her sweets. I found her caramels at the new SoCal Made shop in Mission Valley. The flavors are on rotation by season for the most part, ranging from Sea Salt (recipe below), Chai, Chili Pepper, and Bourbon to Meyer Lemon, Coconut, and Passion Fruit. In fact, Flint grows the passion fruit and Meyer lemons that go into her caramels. She partners with local vendors when she can. So, she uses Dark Horse Coffee for her Coffee Caramel. And if you're vegan, no worries; she's conquered that, too. I tasted three flavors. The Chili Pepper is a sweet powerful spice bomb. The heat is there but it's quite enjoyable. The Chai, with its cinnamon, cardamom, and nutmeg flavors, is Christmas in a sweet bite. And the Beer and Pretzels has that mellow hops flavor with a happy pretzel crunch. Flint, an accomplished home cook, has a flair for flavor and works hard to perfect her vision. 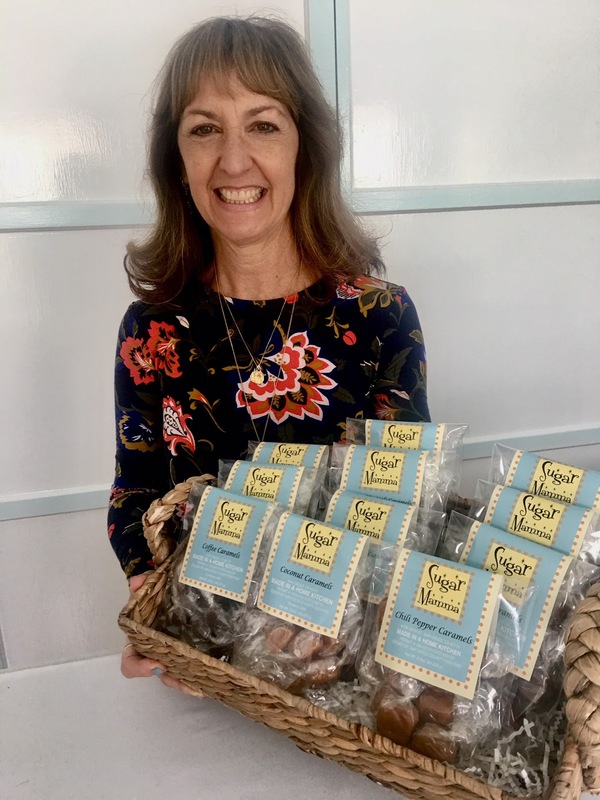 Her Coconut Caramel, for instance, is layered with five versions of coconut--coconut cream, flakes, toasted flakes, extract, and coconut sugar. "Don't be afraid of flavor," she said. "Build them. Test them them. And adjust them until you have them just right." So, instead of just tossing dried chilies into her basic four ingredients to cook them together, Flint now steeps the seeds and dried chilies in cream for two hours to infuse the cream not just with heat but the essence of chili flavor. "Initially, I did it simply and people kept telling me they didn't get any heat. So I kept playing with technique until I got what I wanted. The steeping really made the difference." Flint makes everything by hand by herself out of her Talmidge home kitchen, usually working in the neighborhood of 12 hours a day every day to meet her orders. 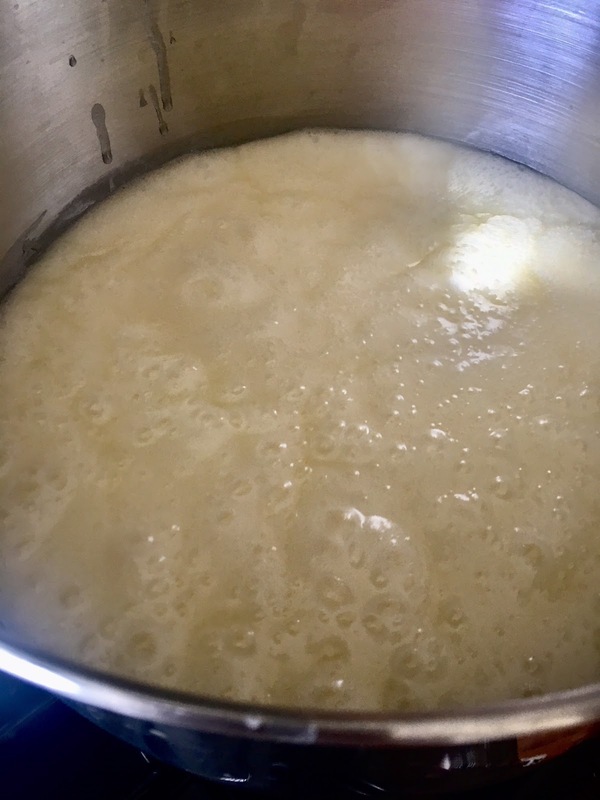 She starts by combining her foundational ingredients--the butter, sugar, cream, and corn syrup, in a large pot, heating the mixture over medium high heat until it reaches 248° F--stirring all the while. 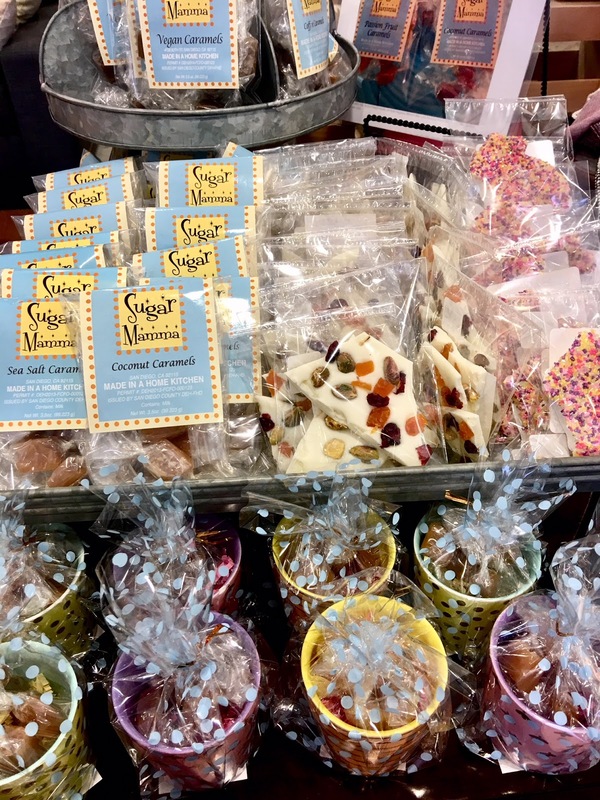 "Once the sugar dissolves, you can step away briefly, but stay close," she advised. "You can stir every minute instead of constantly but you don't want it to stick or burn." 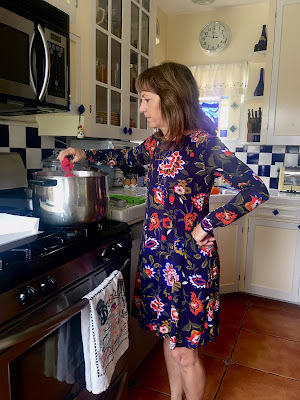 With a jelly roll pan lined with parchment paper next to her, Flint stirs until she reaches the temperature she wants, at which point she removes the pot from the heat. Then she adds kosher salt and vanilla, stirs to incorporate them and pours the mixture into the pan. If it's Sea Salt Caramel, she'll give the mixture a few minutes to set, then sprinkle Maldon sea salt over it. In general, fruity flavors get the fruit addition during the cooking process. Any alcohol flavor gets that at the end of the cooking process, once it's off the heat. Then it sits for 12 hours/overnight to set. 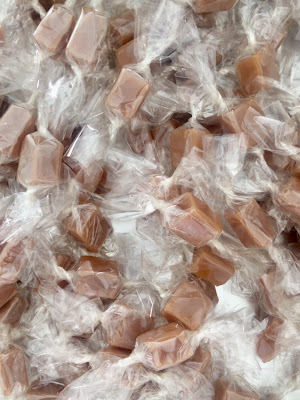 Once fully set Flint cuts the caramel into 1-inch squares, wraps each individually by hand and packages them. 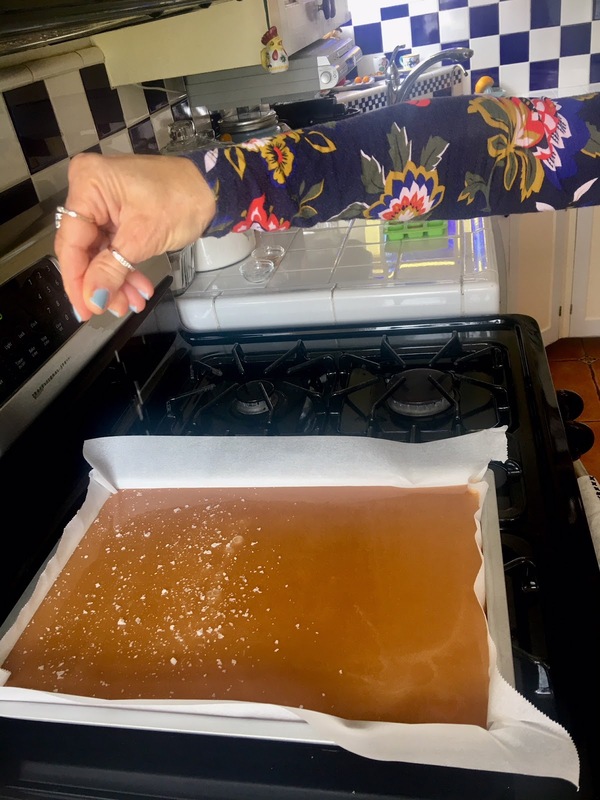 Home cooks can use wax paper squares or cellophane candy wrappers (found across the internet, including Amazon) for wrapping individual caramels, which can last several weeks at room temperature. Pour what comes out into the pan. Don't scrape the dregs of the pot into the pan because they won't crystalize. 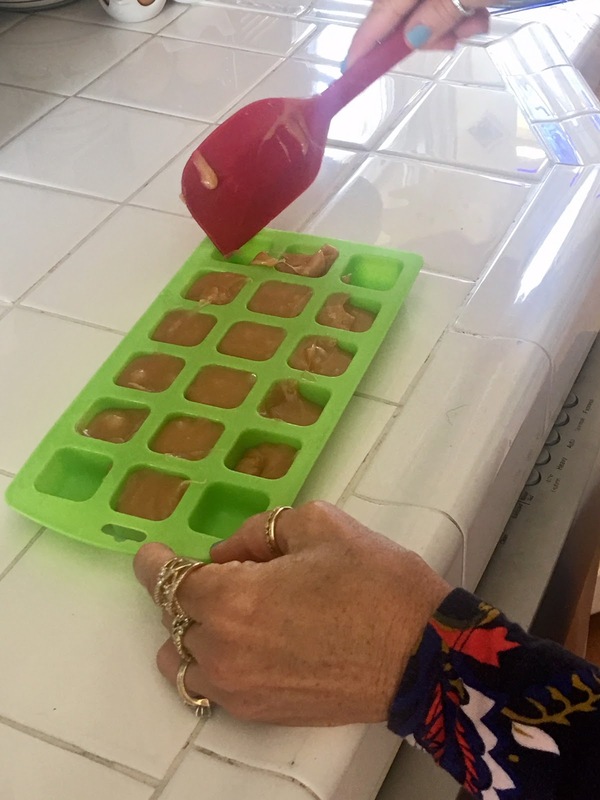 Instead, scrape them into a silicon ice cube mold. Got bubbles? Don't worry. Flint said they tend to pop on their own over the 12 hours.